Grunt returned to winning form with an impressive victory in the 2018 Makybe Diva Stakes at Flemington this afternoon. Grunt started his Spring Racing Carnival campaign with slightly flat efforts in the P.B. 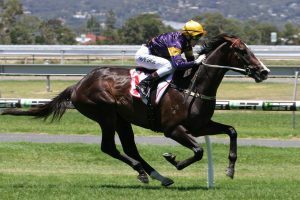 Lawrence Stakes and Memsie Stakes at Caulfield, but trainer Mick Price was always confident that the Australian Guineas winner would be at his best when he got to Flemington and that proved to be the case. Damien Oliver gave Grunt a dream run in transit and the talented four-year-old finished over the top of Jon Snow and Black Heart Bart to score his second win at Group 1 level. Oliver has now won the Makybe Diva Stakes on five occasions and he was delighted to partner Grunt to another victory at the highest level of racing. “He is a really nice horse and I always said that Caulfield isn’t really his track,” Oliver said. “Today was d-day for him, but he is unbeaten at Flemington and he really does enjoy the big open spaces here. “He had a lovely run and when I popped out, he just chimed in perfectly. Price was clearly pleased that his plan to set Grunt for the Makybe Diva Stakes third-up had paid dividends and he was clearly delighted with the effort of his star galloper. Price said that he now has plenty of options with Grunt and races like the Underwood Stakes, Turnbull Stakes, Ladbrokes Stakes, Ladbrokes Cox Plate, Caulfield Cup and even the Melbourne Cup are all on the agenda. “He is just a big Flemington horse,” Price said. “A couple of those weight-for-age horses at Caulfield had his measure, but getting on the beautiful big track here at Flemington is him. “He was just the best horse on the day. “It is three weeks into the Turnbull and then you can go into the Caulfield Cup or you can go to the Underwood and the Ladbrokes Stakes and then you have to go into the Cox Plate. “I am a bit concerned about how he would get around Moonee Valley and I honestly don’t know which way to go. “I think that he will be a beautiful staying horse and it wouldn’t worry me if we ended up in a Melbourne Cup with a lighter weight. Kings Will Dream savaged the line once again to finish second behind Grunt and he remains on track for the Caulfield Cup.